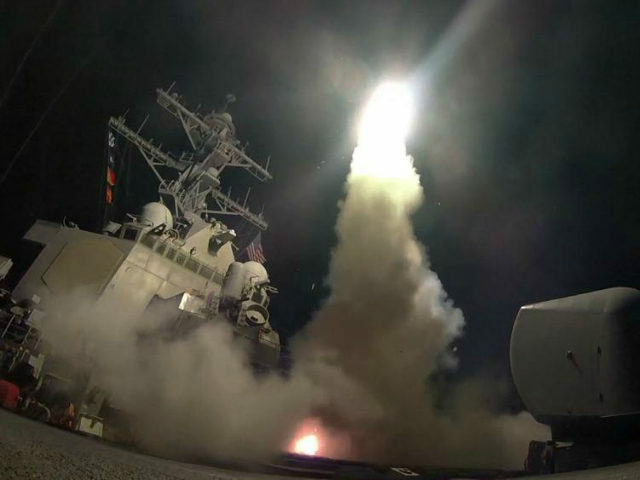 Dr. Sebastian Gorka, deputy adviser to the president and former Breitbart News National Security editor, joined SiriusXM host Raheem Kassam on Friday’s Breitbart News Daily to discuss the American missile attack on Syria. Gorka said statements made by President Trump and Secretary of State Rex Tillerson made it clear whom the United States holds responsible for the Idlib chemical weapons attack. “I’m not going to talk about percentages or how we know, but the fact that those statements were made can make everybody rest easy that yes, the regime was responsible,” he said. Kassam noted that President Trump has been critical of intelligence mistakes in the past, and the memory of faulty intelligence leading into the Iraq War is still fresh in many minds. “Where is the strategic imperative here? How does this help the United States?” he asked. Kassam asked if Gorka was surprised to hear critics of the administration claim the Syria strike was intended as a distraction from President Trump’s troubles. Gorka repeated that both the moral imperative and national security imperative dovetailed in President Trump’s action. “We have sent a very clear message: America is back, America is leading, and America will not be a feckless, spineless non-actor in the international community. Those days are over,” he said. Kassam quoted Sen. Rand Paul’s (R-KY) assertion that President Trump should have come to Congress for authorization before attacking Syria. “How do you stop the train once it’s in motion? We know how these things work. We’ve seen them develop before,” he said. Gorka responded, “I know the president, and I know what he thinks” about the slippery slope into larger actions of the Iraq War variety. Kassam asked if Gorka could offer assurances that the United States would not be drawn into a proxy war, or even direct conflict, with Russia.